The Republican Communist Network (Scotland) has developed a distinctive view on the national question which they call ‘Internationalism from below‘. The Scottish working class ignited the struggle against the poll tax - but is the demand for independence a positive one? Although the theory represents a comprehensive attempt to deal with the national question, in this article I will solely discuss it through the prism of the question of Scottish independence. This provides the most obvious and relevant case study through which to draw out the real implications of the theory, an approach which is necessary since I will be unable here to develop a comprehensive alternative account of the national question. This article represents a moment in an ongoing dialogue between members of the RCN and The Commune, and it is based on the author’s notes from conversations with RCN members. I have read Allan’s recent article on ‘Internationalism from Below’ but have not been able to find a more comprehensive and specific defence of the RCN’s position on Scottish independence in writing elsewhere. A word on nationalism. The RCN define nationalism, fairly conventionally, as a movement in defence of a, or towards an as yet non-existent, state for a “nation”. A nation, similarly conventionally, is understood as an “imagined community” which despite being imaginary – i.e. there is no overall unity of interest, for communists, between the conflicting social classes represented in the nation – is nonetheless real because it constitutes a politically powerful aspect of the subjective landscape. Nations are imaged, but real, and sometimes they become more real still as their subjective power remakes the objective world in its image. The RCN denounce nationalism in both its conventional and ‘left’ manifestations. They are, however, positively in favour of Scottish national independence. The purpose of this article is to provide a critical account of the reasons RCN members give for their pro-independence position, as well as the mechanisms by which they think it could come about. i) constitutional: a pro-independence majority in the Scottish Parliament voting for a referendum on the question and Westminster feeling politically unable to refuse. The question on the referendum would be determined, in the end, by Westminster. If the vote was carried for independence, in this scenario, Westminster would feel compelled to grant it. ii) proto-revolutionary: a working class upheaval, centred round economic or social demands, acquiring a pro-national independence perspective as part of its conflict with the UK state. In order to be successful, independent of constitutional methods, such an upheaval would have to be proto-revolutionary, involving soviet-type structures and militant workers’ autonomy. Such a proto-revolutionary wave may well of course subside without producing a generalised social revolution, which – were it to occur – could hardly be isolated in Scotland. In this article I will not consider scenarios where international communism is produced by revolution, since in such a case the affective autonomy of any local area so wishing could therefore be assumed. The above scenarios are somewhat stylised and polarised. Of course, any constitutional independence movement would involve some grassroots activity, and no doubt in large part be an expression of social, everyday discontent. And it may well be that a proto-revolutionary insurgency would force, or be defrayed by, constitutional measures. For our present discussion I am ignoring the possibility of a fundamentally nationalist, reactionary movement based either on mass mobilisation or para-military action. This is because we can take it as read that the RCN would be opposed to such developments. Nonetheless the above typology is necessary in order to discuss, in concrete terms, the political significance of the demand for independence. It should be said at this stage that, I understand, the RCN are primarily advocates of the proto-revolutionary scenario. Whilst they say there should be a referendum, and whilst they would strongly advocate a yes vote, they believe the British ruling class would be highly unlikely to allow such a scenario to develop. In support of this view, one RCN member recounted to me the measures taken by the state at the time of the 1979 devolution referendum (which returned 51.6% for devolution and 48.4% against but failed due to a stipulation regarding turnout). These included scare stories, agents provocateur, and military exercises off the coast of Scotland. Nonetheless, RCN support for independence is not conditional upon that taking place on a mass working-class, republican, or socialist basis. We will return to an examination of these scenarios later, after a discussion of the various reasons given by RCN members for advocating independence. As part of this I need to explain my general perspective on the matter at hand. I am neither for nor against Scottish independence in principle but tend to think that it is not useful for communists to positively argue for it at present. I do think, however, that if people in Scotland want independence they should have it, and any attempts – whether violent or bureaucratic – to stop them should be opposed. Although I am neither for nor against Scottish independence in principle I can conceive of circumstances in which I may – I say this cautiously since my mind’s not made up – be able to see independence as a demand I could support. In outline, this would be in the context of a strong, independent working class movement, for whom independence was a broad and deep demand, and objectively a necessary means to advance its power. Furthermore, it would need to be the case that independence was not in real terms an alternative to perspective based upon spreading working class struggle, as working-class struggle. Such circumstances may arise, but they are far from guaranteed to do so. In fact, I confess I think them unlikely. I will now consider six arguments for independence (a – f) which rather than quoting specific individuals , I have constructed on the bases of a number of independent comments I have heard and things I have read. Scotland is home to 5 million UK citizens, 5% of UK GDP, Europe’s sixth largest finance sector in Edinburgh, four Trident submarines (with around 200 nuclear warheads and 58 ballistic missiles), four regular British Army garrisons, three frontline RAF bases and six Royal Navy bases. On its North Sea coast lie oil reserves perhaps amounting to 30 billion barrels. Since the power of modern states is based in part upon their capitalist productivity and in part on their capacity to project military power, and much less strongly although still in part on their population, it seems true that Scottish independence would weaken the UK state’s ability to project imperial power, at least in the short term. However, there are several reasons to think that such a weakening would be relatively minor, partial and – most importantly – would not lead to an overall weakening of imperialism as such, or even the particular imperialist bloc of which Britain is part. i) Most obviously, military bases could be relocated, or a deal reached for their continued use. It would be possible to make up the loss in military personnel were there a need for it. It is far from certain that either the constitutional or revolutionary scenario would lead to the £12 billion per annum UK share of oil reserves accruing to an independent Scotland – or even that there will be very much left of it remaining unless independence is achieved within a couple of decades. The loss in population and productive capital would not be large, while GDP per capita in the remainder of the UK would rise. Unless Scotland joined the EU – and adopted the associated neo-liberal legal framework – much capital would relocate to Britain. Only establishing Scotland as a sort of low-tax, low-regulation, business friendly environment could stop this. ii) It is likely that an independent capitalist Scotland would simply rejoin the US/UK imperialist bloc. Imperialism is today, far more than in the 19th century, an interstate system, although there are always very much senior and junior partners. With the same material resources, the bloc would be no weaker than before, just composed of one more state. So it is not even clear that US imperialism would be effectively weakened. Note that this is in no way precluded by the proto-revolutionary independence scenario, assuming that capitalist social relations are left in place. iii) Even if it didn’t join the US/UK bloc, Scotland – still capitalist in the absence of international communist revolution – would simply be forced to join another imperialist bloc, which would be no better. Once again, because proto-revolutionary waves can subside, this possibility is not precluded by the proto-revolutionary scenario. Even if a more ‘left-wing’ capitalist government held power in a Scotland outside the US/UK imperialist bloc, there is no guarantee it would be less imperialist. Consider the example of France – one possible imperialist partner for an independent Scotland. In 1994 it facilitated the Rwandan genocide under the presidency of Parti Socialiste leader Francois Mitterrand and in the context of one of the most self-confident and class-conscious proletariats anywhere in the world. iv) Even if it was true that the US/UK bloc was weakened, this would not necessarily contribute greatly to the weakening of imperialism as such. The US-led bloc is early in what is most likely to be a long but terminal decline from global hegemony, whilst Chinese imperialism – most clearly of all – is on the rise. Since, at least in the proto-revolutionary scenario, Scottish independence may be a relatively distant prospect, the overall significance of any minor weakening of the US/UK power bloc may be much reduced. v) The most important “weakness” of any state is its own working class, that is currently the English as well as Scottish, Welsh and Northern Irish working class. Potentially by placing a relatively militant, leftward Scottish working class outside the UK state, independence could conceivably make the UK state stronger. vi) Just because the UK ruling class is opposed to something doesn’t mean the working class should be for it. It is quite possible that a given national ruling class is opposed to a certain measure because it involves losing ground to another national ruling class, rather than to the working class. In such cases, the working class has no need to take sides. But, someone may ask, why the support in the first place? The answer provided [by Trotskyists] is an example of historical scheme -making: U.S. imperialism will be weakened’ by such movements. Such a ‘weakening’ will impart another ‘transitional’ twitch to the ‘death agony of capitalism’ which in turn will foster other twitches … and so on. Like all mystifications, Trotskyism fails to give a coherent answer as to why, especially since 1945, imperialism has been able to grant political independence to many ex -colonial countries, a possibility that Lenin and Trotsky explicitly denied. Indeed, it seems true that whilst imperialism has changed vastly since World War II, it is not now weaker as a global phenomenon than it was then — despite the global unfolding of national independence. Here I will confine myself to the relation between republicanism and national independence, rather than provide a general perspective on republicanism. seeks to develop a programme for expanding democracy under capitalism as far as it will go. It concerns itself with progressive and in some senses transitional demands. To the extent that we achieve these democratic demands, it will strengthen our class and will weaken the ruling class and its allies. It is a necessary and unavoidable part of the struggle for socialism. For the RCN, independence would represent a democratic advance under capitalism and would therefore “strengthen our class”. While republicanism in general is a “necessary and unavoidable” part of the revolutionary process, it is not clear whether Scottish independence, specifically, is held to be necessary in this way or not. I would like to offer some arguments against seeing independence for Scotland as a necessary component of republicanism, or republican demands as a necessary part of communist propaganda. i) In general, I agree that, all other things being equal (they never are) greater capitalist democracy is an advantage for the working class in its grassroots struggle. For example, I tend to think the AMS (additional member system), not to mention citizen initiated recall votes and referenda for representatives would make capitalists less likely to attack the working class (none of which necessarily makes such reforms an item on the agenda of the class struggle). However, it is hard to see why Scottish independence as such would provide an instance of that. This is because neither smaller states as such, nor states with roughly national boundaries are – all things being equal – ipso facto more democratic. Neither, in itself, implies a greater level of formal democracy. ii) Secondly, communists ought not to reify “national independence” and hence do not reify the nation as such – but rather are in favour of the fullest local autonomy for all those who want it, regardless of whether the unit in question constitutes a “nation”. That is, republicanism as such need not see Scotland as more (or less) deserving of autonomy than Fife or North Yorkshire. The republican demand is surely “autonomy for all those who want it”, not “autonomy for each nation”. The question here is not “is Scotland a nation?” – it is – but ought communists necessarily to privilege the nation as a political unit? I argue, not at all. Sometimes, movements against national oppression may mean that some nations end up developing as immediate bases for political autonomy. In such cases, perhaps it may make sense to positively support a concrete, working class movement for such autonomy. But as I argue below, Scotland is not subject to national oppression in this way. iii) It is true that the UK state has on its statute books a whole array of “crown powers” which could be used to legitimate attacks on the revolutionary working class in any part of the UK. But, firstly, there is no necessary reason why the Scottish working class should not end up fighting these powers on the same terms as the English working class. Secondly, there is no reason that the working class will necessarily fight against the crown powers as laws, rather than just in terms of concrete battles against their manifestations. Thirdly, these crown powers are merely the legal expression of things which the UK or Scottish ruling class would likely be prepared to do illegally if those laws did not exist. The above arguments criticise the positive demand for independence on republican, democratic grounds. They show that the most ardent republican democrat would not necessarily be compelled to call for Scottish independence. The RCN, as internationalists, are not for socialism in one country. However, whilst talking about Scottish independence, the above sentiment does sometimes emerge as a theme of discussion. Indeed, it is an implicit premise of the argument that “struggles to defend social provision” can take the form of an independence struggle. Today, in numerous areas, including higher education and homelessness, Scotland does indeed use its limited devolved powers to pursue policies which are somewhat more pro-working class than those effective in England and Wales. However, if the international decline of left social democracy over the last 30 years tells us anything, it is that ‘progressive’ fiscal policy cannot be detached from the dynamism of domestic capital. At present, ignoring revenues from North Sea Oil, Scotland is subsidised by the rest of the UK to the tune of about £1,500 per head. Taking oil into account the flow does run somewhat the other way but as mentioned previously, (a) It is unlikely that North Sea Oil would be controlled by an independent Scotland, and (b) the oil probably does not have very long left to run and may well dry up before Scottish independence is assured. In consequence, it may very well be the case that independence would precipitate a decline in the fiscal position of the Scottish state apparatus, and consequent decline in social provision in Scotland. As a further consequence therefore, it is at best unclear how independence would form part of struggles to defend the ‘social wage’ in Scotland. In this section I will not consider the argument that the lack of independence in itself constitutes national oppression consisting of the denial of democratic rights. This perspective, I examine in the section dealing with republicanism as a political perspective. Here, I am concerned with national oppression insofar as it affects the day to day lives of people in Scotland. Calls for independence are not necessarily the correct response to national oppression, but serious national oppression could seem to strengthen the case for calls for independence. In conversations with RCN members, I have heard it suggested that the early implementation of the poll tax in Scotland and the closing of Scotland’s heavy industries – particularly mining and ship building – have constituted national oppression. In the case of the heavy industries, I am not aware of any evidence that Scottish workplaces have been targeted more because they are Scottish, any more that those in Labour-voting areas in the north of England for example. Concerning the poll tax, however, it is possible to be more definite. Contrary to popular perception, the poll tax was not implemented in Scotland first in order to use Scotland as a “guinea pig”. Nor was any part of the reason for implementing the tax in Scotland a year earlier than England and Wales as part of an assault on the Scottish working class as such. 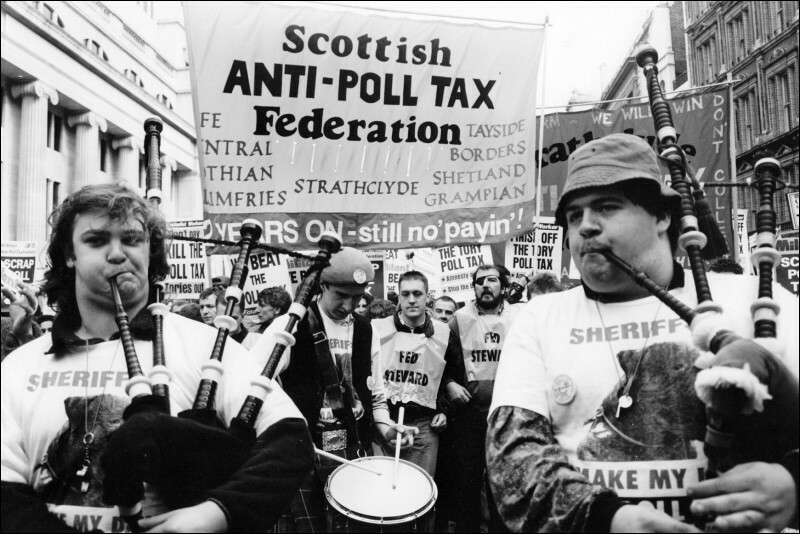 Rather, the poll tax came first to Scotland as a consequence of two main factors. Firstly, the limited extent to which Scotland was already enshrined in UK law at the time as a distinct administrative entity. The 1975 Local Government (Scotland) Act mandated a ratings (local government tax) revaluations system distinct from that prevailing in England and Wales, although 5 yearly revaluations had once been uniform. (see McConnell, Alan (1995), State Policy Formation and the origins of the Poll Tax, pages 80 and 200). The fact that rates revaluations were on a different timetable – even given the provision for delay which were utilised from the 1981 Local Government (Miscellaneous Provisions)(Scotland) Act – in Scotland prompted the Conservative government to rush in the Poll tax, rather than raise rates. In this context, the early introduction of the poll tax in Scotland was less an intentional attack on the Scottish working class because they were Scottish, but rather an accidental product of differentiated – but not necessarily discriminatory – UK law, and the sectional, electoral interests of Scottish Tories. As advocates of working class internationalism, the RCN are not interested only in the Scottish working class, but the broader UK and global working class as well. They believe Scottish independence could contribute to the struggle of the proletariat outside Scotland, for two reasons. The first is that an independence struggle on the proto-revolutionary model, over economic or social demands, could spark equivalent action over similar demands elsewhere. However, it is not clear why working class action in Scotland would have to have a specifically pro-independence character in order to have such a “contagious” effect on the Scottish proletariat. (In fact, it is conceivable that national demands could obscure the social, class base of these demands and hence tend to retard their generalisation). Working class struggles have a record of spreading internationally that indicates no necessary need for them to have a national character. This first argument, therefore, does not provide a reason for communists to advocate Scottish independence in addition to the militant mobilisation on which we all agree. The second argument raised by comrades in the RCN says that, since the UK ruling class would do everything in its power to thwart any independence movement, the mobilisation of militants in England and Wales would be necessary to defeat the ruling class, and achieve independence. However, once again, the UK ruling class can be expected to react with similar vehemence to a proto-revolutionary insurgency around purely socio-economic demands, thereby providing the same potential spark for the struggle to be generalised. In truth, the dynamic, such as it is, is rather minor. Most polls demonstrate support for greater devolution of tax-raising powers is more popular than independence. Even given a straight choice between independence or the status quo, even the polls showing the greatest pro-independence sentiment only show barely 50% backing for secession from the UK. As indicated earlier, there are some circumstances under which – in the context of a working class upsurge and a strong pro-independence dynamic within that – it may make sense to support that demand due to its implicit class character. Chris Ford has argued that Ukraine during the revolutionary wave of 1916-22 was such a case – though I do not know enough about that myself to evaluate the claim independently. Thus, my argument here against the demand for independence is not a timeless one. Rather it is based on the concrete balance of class forces, and the subjective position of the Scottish working class in particular. However, it is very, very far from guaranteed — it is even very unlikely — that a national independence movement with a positive class character would ever emerge. The reality is that examples of such movements in history are very few and far between, and all are contested. Any proto-revolutionary scenario is far away. But in such a scenario, what would be the significance of demands for national independence? The RCN argue in good faith that their potential significance would be a means to make the workers’ struggle more powerful, and help it spread internationally. But there must be real reasons to doubt this. Is it not at least as possible that emphasis on the nation as a political unit, and the independent “republican” state as a worthwhile aim in itself, will inevitably de-emphasise tendencies toward generalising the struggle internationally, on a revolutionary class basis? I offer the above arguments for the consideration of comrades in the RCN, and others, as part of an ongoing dialogue within the communist milieu. In that light I would like to make a couple of things clear about my position. Firstly it is not a cryptic attempt to justify the idea that Scottish revolutionary organisations ought to be ‘subject’ to a broader UK one. I disagree with this view. As suggested earlier, I am for the maximum of local (or group, or individual) autonomy at every level insofar as that is compatible with whatever organisation’s platform is in question. Secondly, I would be totally opposed to any attempts of the UK state to suppress any real working class independence movement, and would support mobilisation against such attempts. Finally, I am certainly not a “unionist”, nor a British or English nationalist. I consider myself an internationalist, and at that one who thinks all good things come from below. My objection is to neither of these component parts of ‘internationalism from below’ but to the specific conclusion that communists ought to be involved in calling for Scottish independence. Do the RCN Denounce nationalism? Their nationalism like their republicanism is not rooted in class. It can be Bourgeois or proletarian. Or both in the popular front sense in a national democratic revolution. For comrade Allan Armstrong nationalism can be proletarian because the working class feels national identity just as strong or even stronger than the ruling class. This is why the RCN assume the class struggle will be nationalist in scotland. In his polemic with jack Conrad in Republican Communist NO 1 1999(also in weekly worker) Allan identifies nationalism with the cause of labour in Wales,Ireland and Scotland. He argues that the real reason for the emergence of these nations was the extension of the vote to the lower orders. In Allens scattered writings the cause of the workers seems to be bound up with a nationalist republican challenge to democratise the capitalist state as an unavoidable or historical stage to communism. I will provide more examples later. hi Barry, I have heard members of the RCN denounce “left nationalism”. You might think that their position necessarily implies nationalism, but I think we need to start by considering seriously what people say about their own position. I hope that someone from the RCN will reply to this piece. Interesting. We in AFed have been discussing this question recently and the “internationalism from below” thing was considered. We should be putting something out soon as a supplement / extension of “Against Nationalism”. I have considered the RCN’S Position in a number of articles and all my comments are based on statements to be found in RCN Publications or in comments by Allan Armstrong. In my article on nationalism in the last issue of the commune all my references to the RCN are based on the written words of Alan Armstrong. I am not making allegations. This is why I am giving references. For instance, In internationalism from below, he states that “what is needed is internationalism or until that is achieved more limited federations based on the principle of internationalism from below”.That is the break up of large states such as Britain. As I have argued before Internationalism from below is a slogan or an abtraction. It does not have a class content. or another way to put this, is that labour is the true content of small nation nationalism. What Allan does is to project an empty category, republicanism from below or internationalism from below, onto different historical and class contexts. Now it is not a matter of nationalism in general. For instance Alan Davidson has argued that specific class interest led to the union and was part of a historical process of bourgeois revolution. The Bourgeois oppossed the treaty. It was the feudal Lords who wanted it and voted for it. Section 21 guaranteed their feudal rights. Material interests not nationalism. The Bourgeois revolution was a complex process. But even if you disagree with Daidsons view (see Discovering the scottish revolution pluto press The origins of scottish nationhood and scotlands bourgeois revolution in Scotland clsss and nation Davidson does not assume nationalism as a popular movement from below dynamic. In Republican Communist issue 3 Allan asserts that the Poll Tax Movement in scotland on which he pins the label Social Republicanism demonstrated internationalism from below when the struggle was extended to England and wales Why was it not simply class struggle which began in scotland due to the earlier imposition of the poll tax in scotland? In the article Allan assumes the various nations England wales Scotland and Ireland are the political basis of the democratic republican challenge, so the poll tax is part of the national democratic movement. In what next issue 11 1998 in the article John Maclean and scottish Republicanism he writes that “a willingness to defy the authority of the UK state had already shown itself in the massive anti poll tax revolt” This is described as the essence of republicanism. But why is a class fight against the capitalist state specifically or primarily republican?or based on nation? First I would like to thank Joe for the tenor of his contribution. The questions he raises are the ones that communists living, working and organising in Scotland need to explain. I have been away for a month and I have only read Joe’s article upon my return. I don’t have an e-mail address for Joe, so I am trying to contact him through the commune discuss forum. I would like him to provide me with the sources of his quotes which he has lettered c) d) e) and f) which I don’t recall. As soon as Joe does this I will write a full reply. In the meantime, commune members who are interested in the RCN’s application of our ‘internationalism from below’ position to Scotland, the rest of the UK and Ireland could look at the recent postings on the Republican Communist Network website, which outline our position in debate with CPGB and SPGB protagonists.